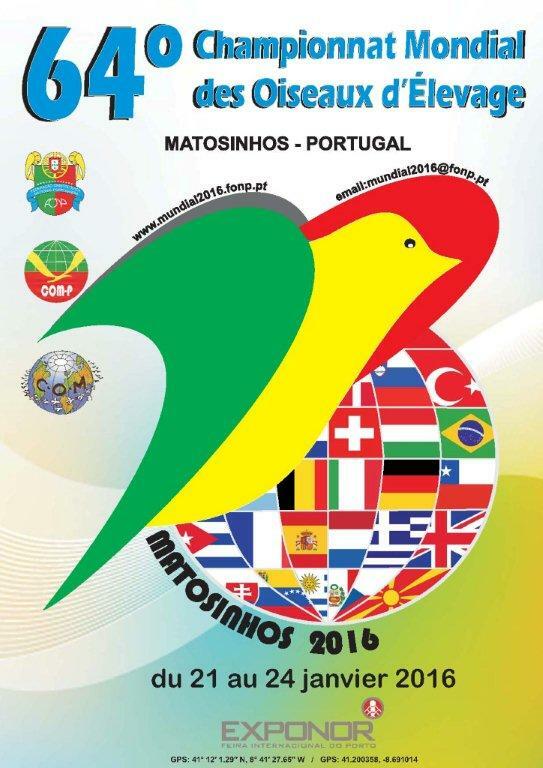 The 64th World was held in 2016 – Matosinhos, Portugal. The 64th World Show held in Matosinhos, Portugal will always be remembered for three very tragic events which happened. First as the IOA always tells the truth these sad facts have to be reported. First in December 2015 the President of the COM from the Southern Hemisphere Luis Beraldi from Brazil suddenly died at the age of 67 years old, he was a very good friend of myself and the IOA and will be greatly missed. In late December the President of the COM Salvatore Cirmi was rushed into hospital with a life threatening illness and was placed on a life support machine. Then, as if these were not too large blows to the show for some unknown reason the transport of the birds from Italy was changed and when the birds arrived at the show a number were found to be dead. No number of dead birds has been told by any one so how many birds were lost in the transport is unknown, to the breeders who lost birds we offer our condolence’s but also the effect it had on the conveyors from Italy was devastating some were in tears. Just how the organisation from Portugal must have been thinking I do not know, five years hard work gone in the matter of minutes. 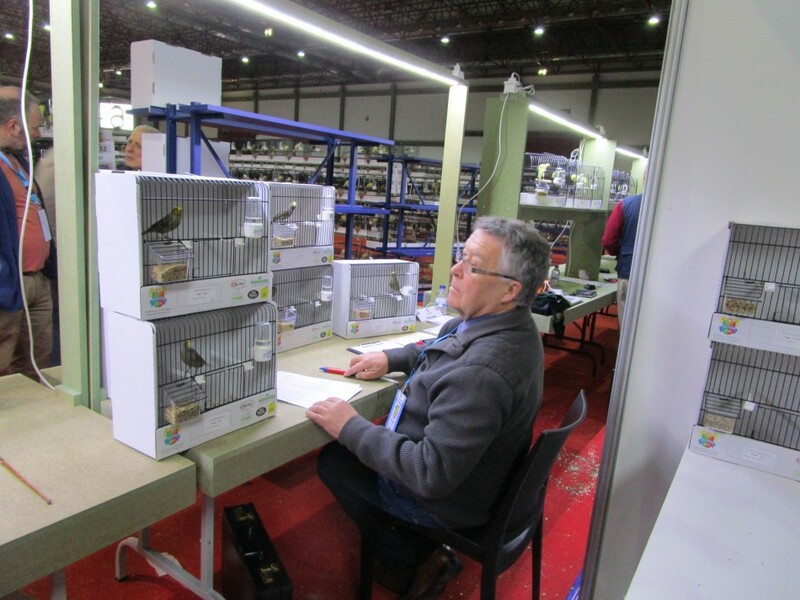 I am pleased to report that COM-UK took 185 birds along with COM-Eire who sent 106 birds and all got to the show and back as they left our shores, we do not transport our birds like the members from Italy. The show commenced with Bernardio Yeves Valero from Spain being the acting president of the COM and what a fantastic job he did along with General sec Marie Claire Tarnus they held the ship together and along with the committee from Portugal who were fantastic, President Manuel Amierio, Carlos Ramoa, Raul Leitao, Rui Vale, Jorge Quintas and Joaquim Cunha. The work this team did was out of this world and no one will ever know how they did it, from COM-UK a massive thank you. The show attracted a record entry for Portugal 21883 birds from 23 nations. The Uk entry for this show was down from pervious years 185 birds were sent from 33 exhibitors yet our medal haul went up to 22 medals in total. COM-UK had six new member exhibitors at their first ever world show. I do not like to single any one out as I think all 33 were winners and thanks for taking part, but as is in life some win some don’t but its the taking part and enjoyment.The Gala dinner was a success with 17 in attendance, it is pleasing to see when the UK anthem was played the ones who are proud to be from the UK and the ones who no the words to the anthem, both my self and Dave Allen blasted it out maybe not in tune, maybe not winners but very proud to wave the flag. For me I have got to name Geoff White from Ferndown he won 3 Gold, 4 Silver with his team of Irish Fancy, he had some good support from Maurice O’Conner who won 1 Gold, 1Silver and 3 Bronze with his Irish fancy team. First time exhibitor Neil Prentice from Stowmarket won 1 Gold with a super stamm of Redpolls. Another first timer Dave Tanner from Aldershot won 1 bronze with a Fife,this bird was sort after by a number of breeders wanting to buy it. World show veteran Simon Tammam won 2 Silver medals with his Parisan Frills. Ken Grigg won 1 Bronze with his Bullfinch mule. 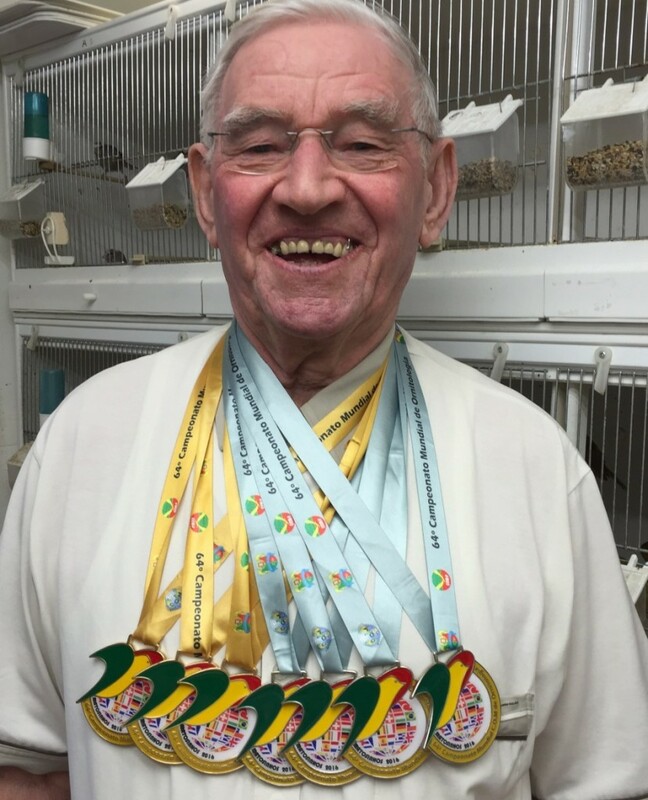 And from the Budgerigar section Ghalib Al Nasser won 1 Gold and 1 Bronze. Bernard Howlett won 2 Gold, 1 Bronze with his Blackbirds. Overall, it was pleasing to see medals being won in the canary section. I would like to say a big thank you to fellow conveyor Gary Mann who took time off work to be at the show and to Peter Sherlock from COM-EIRE who took us in his van and this helped both of us with the cost of going to the show. 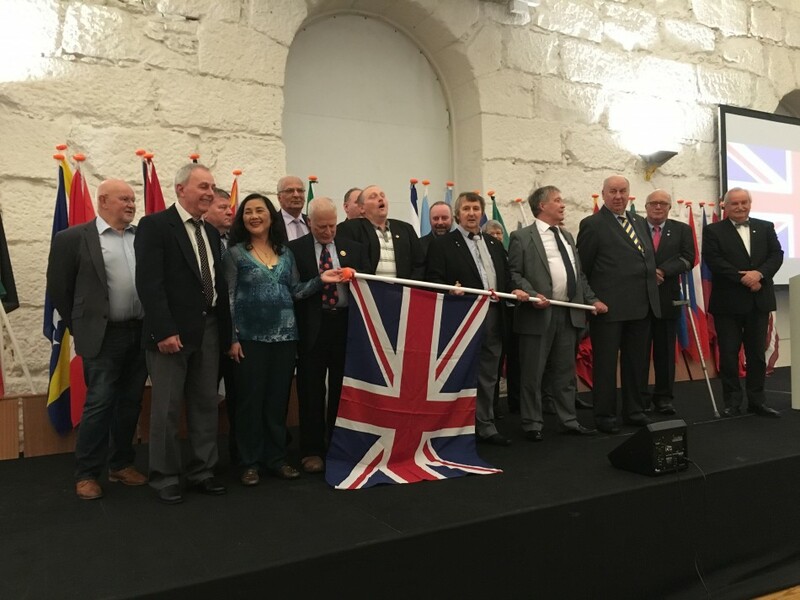 COM-UK at the Gala Dinner, Porto. IOA member Geoff White with his 3 Gold and 4 Silver medals. The UK’s leading medal winner. IOA member Neil Prentice with his GOLD medal which he won with a stamm of Redpolls 366 pts. 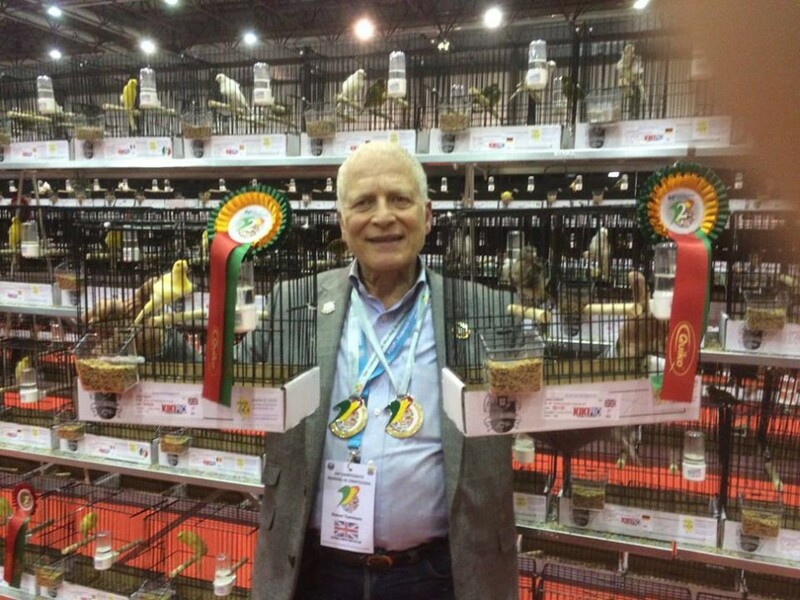 Brian Hogg (COM-UK) OMJ judge at the World show judging section E canary. 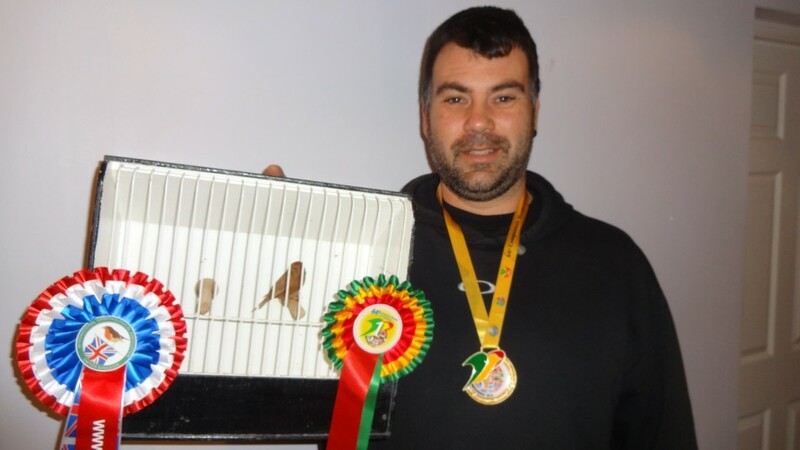 Simon Tammam with his 2 Silver Medal winning Birds. At this world show the COM elected a new President General as Salvatore Cirmi stepped down from the position, so from Portugal Carlos Ramoa is now in this position for the next three years. The OMJ also have a new President as after a vote by the members Roberto Rossi from Italy won the vote from Pierre Groux. The United States of America were voted into be members once again of the COM for 2016, and I had the honour of looking after a delegation of 6 members from the USA for two days at the show. They were thrilled with how a show like this was run and took back some good ideas back to the States.